3 - We are cultivating the soil and praying for a good growth season this spring. 4 - We look forward to celebrating the green fields and growing crops. 5 - But for now, we are in the midst of solemn work, the almost joyless task of turning soil. 6 - We are planting seeds. 7 - We are the seeds. 8 - You and I are he and she. 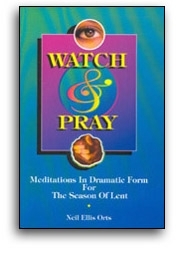 9 - We are entering the cold, dark ground that is the Lenten season.